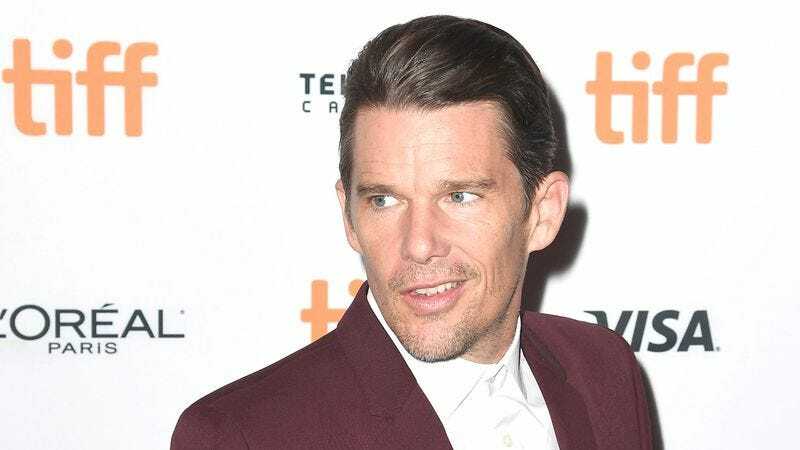 According to The Playlist, Ethan Hawke and Amanda Seyfried have signed on to star in the next film from Taxi Driver writer and Dog Eat Dog director Paul Schrader. Titled First Reformed, the film is ostensibly about losing faith and trying to get it back, but that really sells this project short. Based on The Playlist’s description, at least, it sounds like there are a lot more things going on here. For starters, Hawke stars as Toller, a former military chaplain who is struggling with his faith and is “tortured by the loss of a son he encouraged to enlist in the armed forces.” That could be a movie on its own, but First Reformed throws in a young woman named (Seyfried, presumably) who befriends Hawke and is married to a “radical environmentalist.” Soon Toller discovers that his church is working with “unscrupulous corporations,” Mary’s husband unexpectedly kills himself, and then Toller “embarks on a mission to destroy a gathering of the corporate heads” at a big event for his church. We’re not sure if that literally means he’ll be going on a vengeance-fueled rampage, but it kind of sounds like that. As we pointed out up above, Schrader did write Taxi Driver. First Reformed is in pre-production now and is set for release next year.